In recent years, we’ve seen the introduction of several coral species into the West Atlantic. The earliest of these, dating back to the 1940’s, was Tubastraea aurea, the Orange Sun Coral, likely brought over unintentionally on the hull of a transoceanic ship or in ballast water. This would happen again with T. tagusensis and T. micranthus. 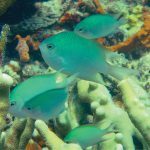 This trio now forms a dominant part of the region’s coral reef ecosystems, especially so on manmade structures like oil rigs, where they effectively outcompete the native fauna. 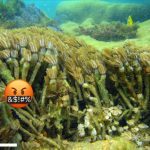 We’ve also seen some familiar aquarium soft corals—Blue Xenia and Green Clove Polyps—introduced along the Brazilian coastline, likely stemming from a misguided Brazilian aquarist dumping their pets into the ocean. These disparate coral invasions, together with the new Caribbean populations of the Lionfish (Pterois) and the Regal Damoiselle (Neopomacentrus), are quickly working to undo the millions of years of isolation that these reefs have enjoyed. And now there’s (possibly) another name to add to this growing list, Oculina patagonica. 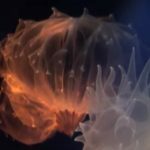 The story of this coral and this genus is really quite fascinating and perfectly illustrates how little we actually know about them. Oculina are a common component of sedimented, Caribbean reefs. Four taxa are presently recognized, each of which is described based on its unique branching morphology; however, genetic study to date has failed to support any of this. Instead, it seems there are really only two species: one occurs in shallow waters (<30 meters) and is zooxanthellate, while the other is azooxanthellate and occurs at mesophotic depths (50+ meters) off Florida, forming the Oculina Banks. This latter form is potentially undescribed and imperilled by illegal trawling, with 90% of this unique habitat said to have been damaged. 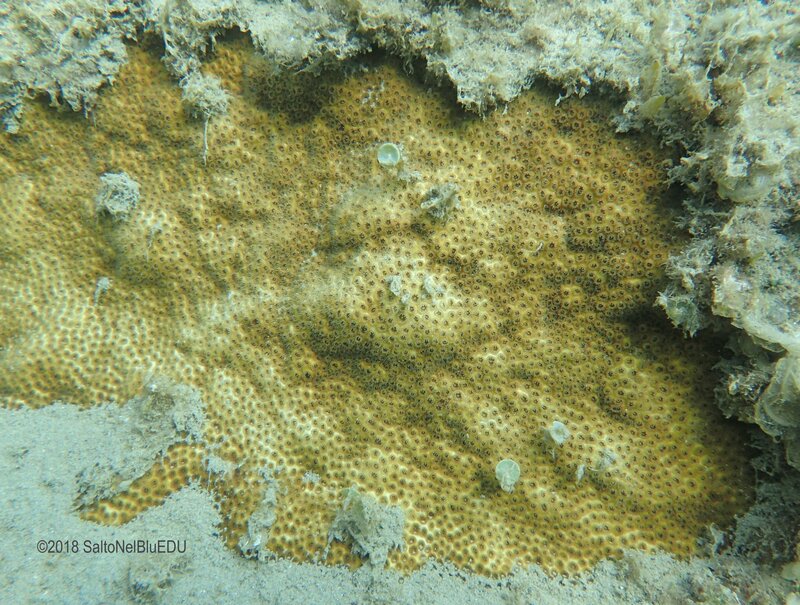 Deep-water Oculina Coral banks occur off Florida’s east coast at depths of approximately 200 to 400′. They were first discovered by Harbor Branch researchers in 1975 and efforts to preserve them are still ongoing. Somewhere around 2012, a completely different type of Oculina was reported from near the port city of Veracruz, Mexico. Unlike the branched varieties previously reported in the West Atlantic, this new Oculina formed encrusting colonies, and it appeared similar to a mysterious species that had recently invaded the Mediterranean, O. patagonica. Oculina patagonica was described more than a century ago from fossilized specimens found in the Patagonian region of South America, and (this is the important part) it has never been found alive anywhere near its type locality. Not a single living colony has ever been seen in South America, but, in 1966, specimens identified as this species were unexpectedly found in an Italian harbor. 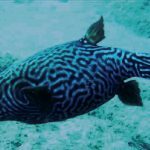 The Mediterranean’s marine fauna is among the best-studied on the planet, so the novel discovery of a stony coral in shallow waters was naturally presumed to represent an invasion. In the years since, this coral has spread quickly, with populations now known everywhere from Tunisia to Israel and the Black Sea. The Canary Islands have recently added it to their list, but the largest population appears to be found along the southeastern coast of Spain. It was first sighted here in 1992 from a single location along the Catalan coast, and, in the years since, it has expanded itself in two independent waves northwards and westwards. 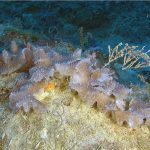 Research has been ongoing to determine the origin of this recent Mediterranean expansion, and the initial results are suggesting that these corals are truly distinct from those in the Caribbean. The question now is whether these encrusting colonies are the same as the fossils from South America, O. patagonica, or instead represent an undescribed species with a shared morphology. Given what we know about the pattern of speciation in the Atlantic, the latter scenario is almost certain. Another name to toss into this discussion is Schizoculina, which has on rare occasion entered into the aquarium trade. This genus contains two poorly studied species from the coast of West Africa, with a morphology that seems intermediate between the Mediterranean’s encrusting form and the branched varieties of the Caribbean. It’s recognition as a separate genus is likely misleading in this instance, as the main difference used to justify its classification stems from the manner in which the polyps bud (intracalicular vs extracalicular), a trait that has been found to be highly unreliable among the recently revised merulind corals. This gives us an interesting hypothesis for the Mediterranean’s Oculina invasion. Could it be a recent expansion or introduction of one of these Schizoculina? There’s unfortunately no genetic data to confirm this at the moment, but the alternative hypotheses seem rather implausible. There’s little reason to believe that this is a native species in the Mediterranean, as it would have been found long ago—these occur in the shallowest of waters and are easily observed—and the genetic work done on these populations supports this notion as well. It’s even less likely that the South American fossiliferous O. patagonica is relevant. As we saw with the confusing taxonomy of the Caribbean species, morphology is a poor indicator of evolutionary history in this group of corals. And this gets us back to the Veracruz specimens that were recently discovered. The encrusting morphology led the authors to identify them as O. patagonica, but the genetic data they provided are mostly irrelevant, as they could only compare their specimens to others from the Caribbean. Interestingly, they didn’t find much to differentiate their encrusting colonies from the existing data on the branching Caribbean taxa. Which raises an obvious question here… is the morphology misleading us? There are simply too many unknowns in Oculina to elucidate what is occurring here. It’s not unreasonable to presume that there is a recent introduction of a new Oculina into the waters around Veracruz, with a source somewhere in the Eastern Atlantic. If so, we can expect to see this one become widespread in the coming years, probably following a similar path seen with Neopomacentrus in the region. Alternatively, these could simply be aberrant forms of the native Caribbean Oculina. These corals are now known to be highly mutable in their colony shape, and it doesn’t stretch credulity to imagine that they can form an encrusting morphology. Alas, our narrative here is going to be left uncertain until more genetic work is done. Eytan, R.I., Hayes, M., ARBOUR‐REILY, P.A.T.R.I.C.I.A., Miller, M. and Hellberg, M.E., 2009. Nuclear sequences reveal mid‐range isolation of an imperilled deep‐water coral population. Molecular ecology, 18(11), pp.2375-2389. García, N.A.C., Campos, J.E., Musi, J.L.T., Perez-España, H. and Carrara, X.C., 2018. First record of the invasive coral Oculina patagonica de Angelis, 1908 (Cnidaria, Scleractinia) in the Gulf of Mexico. Check List, 14, p.613. González-Gándara, C., C. Domínguez-Barradas, V. De la Cruz-Francisco, F. A. Solís-Marín, and J. P. Carricart-Ganivet. 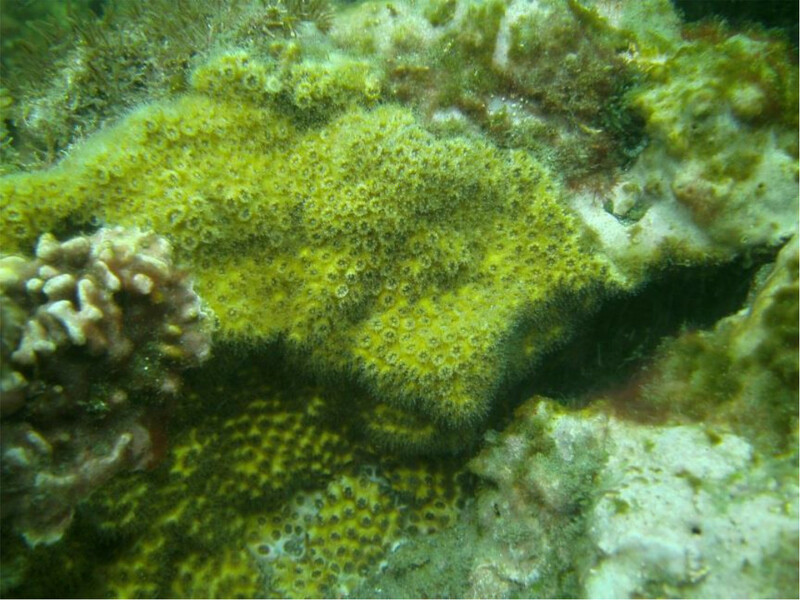 “Esponjas, corales escleractinios, equinodermos y peces de arrecifes coralinos del norte y sur de Veracruz.” Universidad Veracruzana. Facultad de Ciencias Biológicas y Agropecuarias. Informe final SNIB-CONABIO, proyecto No. JF124. México DF de: http://www. conabio. gob. mx/institucion/proyectos/resultados/InfJF124. pdf. Ultimo acceso: febrero 20 (2015): 2016. Leydet, K.P., Grupstra, C.G., Coma, R., Ribes, M. and Hellberg, M.E., 2018. Host‐targeted RAD‐Seq reveals genetic changes in the coral Oculina patagonica associated with range expansion along the Spanish Mediterranean coast. Molecular ecology, 27(11), pp.2529-2543. Leydet, K.P. and Hellberg, M.E., 2015. The invasive coral Oculina patagonica has not been recently introduced to the Mediterranean from the western Atlantic. BMC evolutionary biology, 15(1), p.79.